189. Radiators for hot-water heating should be composed of vertical tubes, and these must be connected with ample waterways at both top and bottom. The continuous pipe coil which is so effective in steam heating, has few advantages when applied to hot-water heating, and is quite inferior to the vertical loop radiator. The circulation in a coil will gradually stop as air collects in the upper pipes or the header, but it will continue in a vertical loop radiator (see Fig. 68) as long as the level of the water is above the line a, in the figure. If it falls, say, to the line b, the hot water will diffuse slowly up each side of the loop, while the main circulation passes directly from the inlet to the outlet. The connections of the loops to each other at the bottom should be more than equal in area to the supply pipe, otherwise the resistance will be so great as to seriously impede the main circulation. 190. 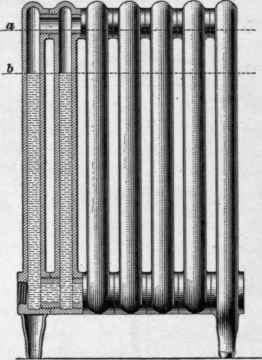 Hot-water radiators are often made with three tubes in each loop instead of two, and it is supposed that the water will ascend in the central tube and descend in the side tubes. There is, however, no appreciable difference in operation between the three-tube loops and those having only two tubes. Hot-water radiators must have two connections, one for the inlet and the other for the outlet. They cannot be operated successfully with a single connection. The supply may enter the top or bottom of the radiator, but the outlet should connect at the bottom. 191. In using hot-water radiators for indirect heating, particular care must be taken to prevent them from being frozen by circulation being shut off. The best preventive is simply to connect such radiators direct to the system without any controlling valves being attached to them. This will insure a constant circulation while a fire remains in the boiler.